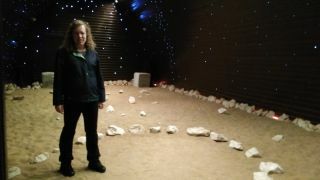 Space.com freelance journalist Elizabeth Howell walks on "Mars" at the Institute of Biomedical Problems in Moscow. It's a quiet morning on Mars as I carefully walk on the dusty ground, watching my step so I don't trip on any of the rocks underfoot. My colleagues carefully examine my movements so they can take pictures to relay back to fans following my mission. "Mars," of course, is only a simulation — but it sure feels real to be standing in this small room at the Moscow Institute of Biomedical Problems, literally following in the footsteps of the three Mars-500 crews that stayed here between 2007 and 2011. The missions were 15 days, 105 days and 520 days long, with the last mission simulating the entire trip between Earth and Mars. Mars-500 may be the most famous of the institute's missions, but it's by no means the only one. The institute is known for conducting long-term simulations of stays in space using both cosmonauts and ordinary people. Sometimes participants work in simulations in this habitat, and sometimes they are in bed-rest studies to simulate the medical problems of space. While no simulation is perfect, the scientists set goals to better understand aspects of real spaceflight. One of the modules that was used by the Mars-500 crew that simulated a 520-day Martian mission. The modules are being repurposed for a new set of isolation missions called Sirius. The next set of missions, called Sirius, will examine how people behave in microgravity, Voloshin said. Today, he is decked out in a T-shirt plastered with cosmonauts in different positions — and even a floating cat in a spacesuit. His enthusiasm for the program comes through experience: Voloshin has participated in two bed-rest studies that lasted a total of six days between them, he told me proudly. On the scale of enclosed facilities, the one that housed Mars-500 is rather large, encompassing multiple modules in a room that is probably about the size of a college basketball gymnasium. Sirius will use up to five modules here, depending on the length of the mission being performed. The first phase of the mission (which took place in 2017) had six crewmembers (three men, three women) stay in two modules for 17 days. It was led by Serov Mark Vyacheslavovich, a 45-year-old engineer whose résumé sounds like a cosmonaut's; he is a planner of the Moscow mission control chief operational control group, and deputy director of advanced piloted complexes for rocket manufacturer RSC-Energia's Spaceflight Center. In just over two weeks, the crew performed a dizzying array of experiments in psychology, physiology, human factors (such as making sure human bodies work with the spacecraft and systems), medicine and much more. And that's just a preview of the experiments coming up. Voloshin highlighted several — crew members will practice dockings with a Canadarm simulator; their movements will be tracked by sensors to see which modules they prefer to use; and virtual reality will be used to monitor their psychological health and to help them drive Mars-type rovers on the simulated surface. The next phase of Sirius is expected in early 2019. The view of several modules used by the Mars-500 crew that simulated a 520-day Martian mission. Preparing for Mars also includes a complex array of experiments away from the high-profile simulations. Outside of the many experiments performed on the International Space Station, scientists all over the world perform bed-rest studies to better understand how people's bodies react to extended periods of microgravity. At the institute, most of these people are ordinary folks — not cosmonauts. I remarked to Voloshin that it must be because the cosmonauts are very busy training for real spaceflights. "Ordinary people are also cheaper," he said in English with a laugh. Voloshin brought the interpreter and me into a different building where so-called "dry" immersion studies are performed. In the small room, there are three tanks for bed-rest patients. Instead of lying on actual beds — where the pressure of the fabric can influence the body's fluid shift and alter the experiment — participants lie on bathtub-size tanks of water, supported only by an insulated blanket. They lie down for most of the day; if they need to use a toilet, a trained team transfers them to a mobile bed that is wheeled to a nearby bathroom. When people participate in these studies for several days or weeks, we see some of the same effects that we do in spaceflight, Voloshin explained. Some of them are well-known, such as shrinking muscles and fluid redistribution. But there are still several mysteries. One experiment looked at why astronauts often get back pain in space. Another one — which Voloshin participated in — tried using electrical stimulation for muscles to counteract the weakness that develops. I can't imagine lying on one of these beds for more than a few hours, staring at the white ceiling, but Voloshin said people have performed experiments here for as long as 56 days. The last one in September was three weeks long. And occasionally, the work in this room can be used to help people with certain medical conditions. For example, institute investigators developed a bodysuit called a Regent, which resists the movement of muscles and helps to strengthen them. It's been used for patients who had an ischemic stroke — when blood to the brain is blocked by a blood clot — and Parkinson's disease, according to a brochure I received from the institute. Institute investigators also created a device to stimulate foot support in bed patients with motor disorders, among several other uses. As Voloshin ended my tour, he apologized, saying that in 90 minutes he can show me only a fraction of the work the institute does to prepare for Mars. Some of its other work includes helping to rehabilitate astronauts coming back from the International Space Station, creating exercise equipment that cosmonauts use in space to stay healthy, and doing experiments in space biology — including sending satellites aloft with living organisms, to better understand how microorganisms behave in the space environment.